.... Afternoon! It's a bit dull and grey here in Northville today, but that's okay, I've spent most of today in my craft room. I've been extremely busy in there for the past couple of weeks - I've been reorganising and tidying - I'll share more of that in a post next week. I have several great-nephews so I always need a good supply of birthday cards for little boys. I kept this one quite clean and simple as I wanted to showcase these cute little monsters. I stamped them on white card, coloured them with Copic markers, put them back in my MISTI, restamped with Versafine onyx black and embossed them with clear powder. I used the matching dies to cut them out. 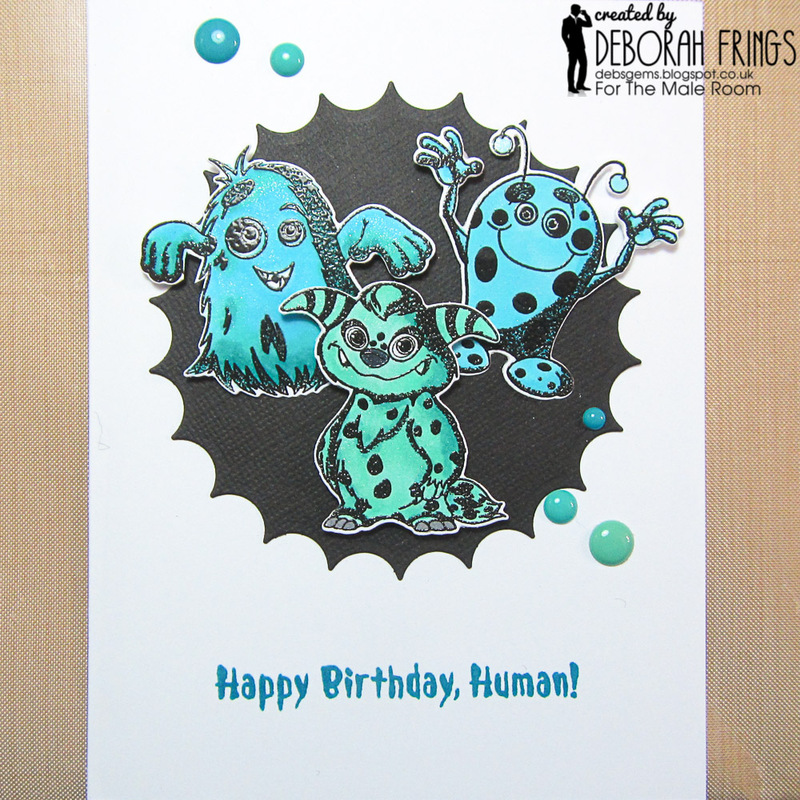 I die cut a black circle background which I adhered flat to the card. I stamped a greeting in dark aqua ink and finished the front by attaching the little monsters. I used dimensional pads to get different levels for the monsters. 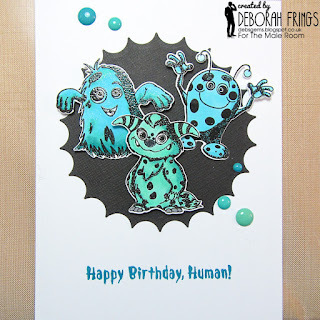 I added some sparkle to the monsters with a clear Wink of Stella brush and finished off with some aqua enamel dots. 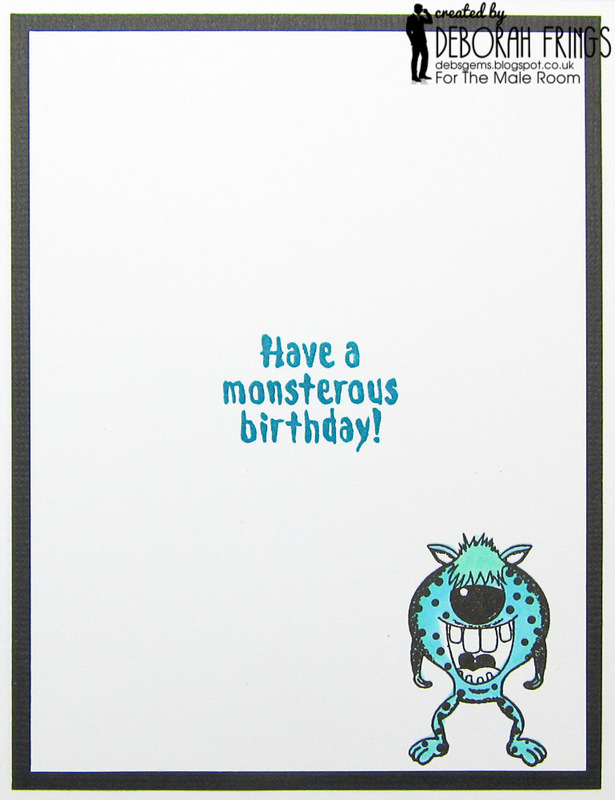 On the inside, I cut a mat layer of black card and added a fun greeting and another little monster to the white panel. 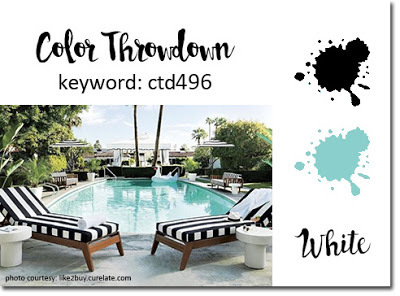 I'm submitting this card to Colour Throwdown - CTD#496, to CAS-ual Fridays Challenge - CFC#201, and to CAS on Friday - CASOF#134. Before I go, I need to let you know that we're having a Design Team call for The Male Room. If you want to join the team - you need to create a masculine project based on out Little Boys theme - you can create any kind of papercraft project and add the initials DT when you submit your project. You've got plenty of time to play along, the deadline for submission is midnight (BST) Tuesday 19th June (that's 7.00pm EDT in the States). Good luck! I love your card Deborah, it is adorable! Thanks so much for joining us at CAS-ual Fridays. Oh my goodness--so, so cute! I LOVE this card, those monsters are gorgeous. 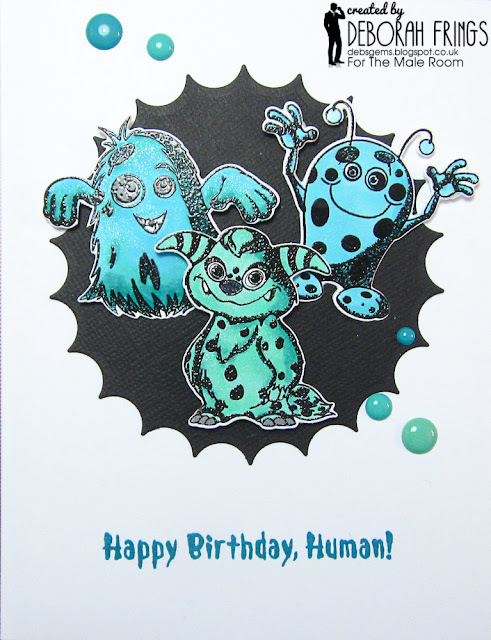 What a fun card for the guys! Thanks so much for playing along with everyone at the CAS-ual Fridays Challenge. I love little monsters, adorable. Thanks for playing along at CAS-ual Fridays.